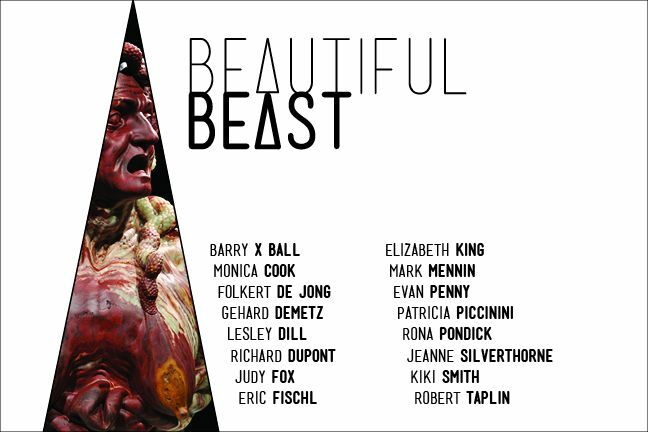 New York, NY, November 20, 2014 – The New York Academy of Art is pleased to announce "Beautiful Beast," a group exhibition of 16 acclaimed sculptors. This dynamic and interdisciplinary show explores the relationship between beauty and abjection through the lens of the grotesque with works by Barry X Ball, Monica Cook, Gehard Demetz, Lesley Dill, Richard Dupont, Eric Fischl, Judy Fox, Folkert de Jong, Elizabeth King, Mark Mennin, Evan Penny, Patricia Piccinini, Rona Pondick, Jeanne Silverthorne, Kiki Smith and Robert Taplin. Opening with a reception on Tuesday, January 27 from 6 to 8pm, the exhibition will remain on view through March 8 at New York Academy of Art, 111 Franklin Street in Tribeca. Connected by their use of distortion to create fearless depictions of humanity, the work of "Beautiful Beast" runs the gamut of human emotion, often teetering towards the uncanny. Highlighting a wide range of work made over the past 20 years, the exhibition encompasses a variety of materials including foam, wood, steel and digital projections. In her new work created for "Beautiful Beast," Monica Cook fabricates distorted figures out of disposable, but still haunting materials while Mark Mennin debuts a human-chicken hybrid out of flesh-colored Portuguese marble. This paradox using finely crafted materials and debased materials to address horrific imagery is further echoed throughout the exhibition. Ball X Ball’s work uses Mexican onyx to create corroded images of Renaissance masterpieces. Gehard Demetz’s finely crafted wooden sculptures present isolated figures whose desperation is implied through the use of empty drawers. Leslie Dill creates a storm of tin imagery spewing from the back of a seated figure. Richard Dupont’s digitally rendered self-portrait appears flayed when suspended from the wall, echoing Michelangelo’s The Last Judgment. Judy Fox creates ethereal figures surrounded by writhing, almost human worms. Eric Fischl revisits a moment of cultural horror to make a balletic elegy to lives lost. Folkert de Jong uses discarded materials to create comical analogs to the history of monumental sculpture, Elizabeth King animates a personal doppelganger whose delicate joints lead the viewer into the revulsion of the uncanny valley. Patricia Piccinini's magically sculpted figures create scenes of tenderness and bittersweet longing between humans and beasts. Evan Penny warps reality by stretching the mundane into anamorphic projections. Rona Pondick sculpts highly polished stainless steel self-portraits of the artist as a dog. Jeanne Silverthorne makes the miniature monumental while creating an existential world filled with doubt and longing. Kiki Smith uses the life cast to create a sense of intimacy, immediacy and an awareness of the viewer’s own humanity. Robert Taplin stages miniature metaphysical dramas using Dante’s Inferno as a point of departure. "Beautiful Beast" is curated by artist and Dean of Academic Affairs Peter Drake and organized by Elizabeth Hobson. The exhibition is generously sponsored by Cadogan Tate Fine Art. A variety of public programs, including artist talks, will be presented in conjunction with the exhibition. For more information visit nyaa.edu/exhibitions. Founded in 1982 by artists, scholars and patrons of the arts, including Andy Warhol, New York Academy of Art is a graduate school that combines intensive technical training in the fine arts with active critical discourse. The Academy believes that rigorously trained artists are best able to realize their artistic vision. Academy students are taught traditional methods and techniques and encouraged to use these skills to make vital contemporary art. The Academy serves as a creative and intellectual center for all artists dedicated to highly skilled, conceptually aware figurative and representational art.